The greatest tragedy of Rana Plaza is that no-one should have died. Cracks had appeared the day before the eight-storey building outside the Bangladeshi capital, Dhaka, collapsed. The building had been evacuated, but the next morning managers at garment factories there demanded workers go back in. That led to one of the worst industrial accidents of modern times. Just after 09:00 local time on 24 April 2013, Rana Plaza came crashing down, killing more than 1,100 people and injuring more than 2,500. The fact that workers didn't feel able to stand up to pressure from their managers to go back into the doomed building led to one of the key recommendations in the wake of the tragedy. Even US President Barack Obama joined the calls to strengthen workers' rights. Bangladesh "is not taking steps to afford internationally recognised worker rights to workers in the country," he told Congress three months after the tragedy. Rana Plaza revealed in horrific fashion how we all play a part, albeit indirectly, in what happens in the garment factories of Bangladesh. The factories in the building were making shirts, trousers and leggings for nearly 30 Western retailers and brands including Benetton, Primark, Matalan, Walmart and Mango. They were part of the incredible boom the country's garment industry has experienced over the past 40 years. From almost nothing it has grown to become the world's second biggest exporter of clothes after China. Garment makers in Bangladesh now employ four million workers, who create exports worth $25bn (£16.6bn) a year - 80% of the country's total. There is no question the industry's growth has helped to lift millions of Bangladeshis out of poverty but the price has been low wages, poor conditions and shoddy buildings. There have been improvements in the wake of the disaster. The minimum wage has been increased and international brands have got together to finance fire and building safety improvements in the factories they use in Bangladesh. Bangladesh has also changed the law to make it easier for workers to set up unions. The number of unions has increased but, two years on, some factory owners in Bangladesh are still trying to stop workers organising. "You want to do union activities? Then we will shower you with blood," one garment factory worker told Human Rights Watch researchers his assailants had said as they beat him with iron bars. The quote is from the pressure group's new report on labour rights in Bangladesh. It confirms evidence the BBC has gathered, which shows intimidation, dismissal and assault are common when garment workers attempt to form unions. We spoke to a garment factory worker who said he had received threats after he became a union leader at his workplace in Dhaka. He is so afraid of repercussions he didn't want his face shown in our reports. "I was told 'you might get abducted or go missing, someone could shoot at you'", he said, clearly still terrified. "I have two young daughters - if something happens to me, what will happen to my family?" Another union leader played me an anonymous call he had received on his mobile phone. "I am calling you as a well-wisher," the caller told him ominously. "You need to act quickly. Your boss is planning a bad game against you. You have been accused of sexual harassment. "You are a trade union leader and you know what you need to do." Kalpona Akhter, who worked in garment factories as a child and now runs one of the biggest labour rights organisations in Bangladesh, says workers come to her group for help every day. "And every day we get at least one or two complaints that they are trying to organise and are facing harassment and intimidation from factory owners." The government says unions exaggerate the scale of the problem. "Cases of union members being harassed do exist, but the number is very small," says Labour Minister Mohammed Haque. He says his ministry takes such complaints seriously. "If we come to know about it we send our labour inspector there immediately and take action." Yet fewer than 10% of Bangladesh's 4,500 garment factories have unions. Freedom of association - the right to set up unions - is a basic human right. Intimidation denies workers that right and - as Rana Plaza showed - that can have deadly consequences. Human Rights Watch concludes that the government, factory owners and the international brands that buy from them all need to do more to ensure workers rights are protected. And we need to play our part too, recognising the real costs of the cheap clothes we buy. How cheap do we expect our clothing to be? 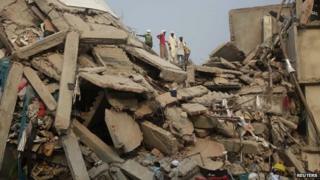 Video Dhaka factory collapse: Can clothes industry change?